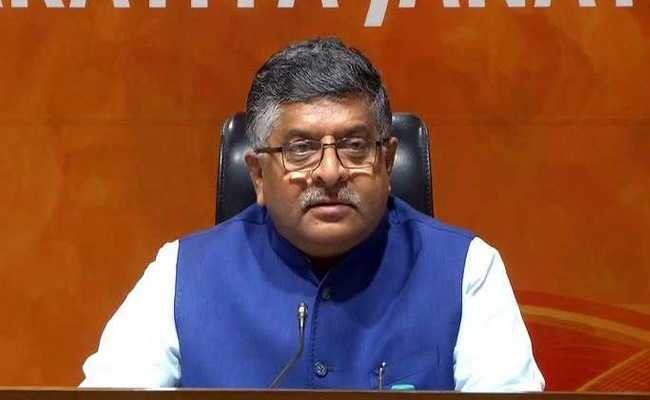 The biometric data of Aadhaar cannot be hacked even if someone tried a billion times, Union Minister for Information Technology Ravi Shankar Prasad said on Sunday, while calling the data storage system "completely safe and secure". "... the system contains my fingerprints and my iris scan, kept in a safe and secure condition which cannot be broken into even with billion efforts," Mr Prasad said at a public function organised in Panaji. The minister said that Aadhaar authorities conduct nearly one crore authentications every second. "Do you know how many authentications we do every three seconds? Three crore. Do you know how many bank accounts are linked to Aadhaar? 80 crore accounts. And Aadhaar is your homegrown technology (at) one dollar each and completely safe and secure with proper parliamentary approval." "(It is) so tough that even if I disclose information regarding a fingerprint and iris scan to an unknown person, except in case of national security, I can be prosecuted. That is the inclusive part we have done," Mr Prasad said, lauding the Modi government for "taking rapid steps in making India more digital". "What is the digital profile of India? For a population of 130 crore, India is home to 121 crore mobile phones, 450 million smartphones, 50 crore plus Internet (connections) and 122 crore Aadhaar cards," Mr Prasad said. Calling ''Digital India'' as a transformative programme designed to empower the ordinary Indians with the power of technology, Mr Prasad said that India looked to be a leader in digital revolution. "We missed the industrial revolution, we missed the entrepreneurial revolution, which happened in the world in the 60s, 70s, and 80s because of licence-quota raj. We do not want to miss the digital revolution. We want to become leaders. That is the philosophy of Digital India," he said. Mr Prasad said that one of the key objectives of Digital India is to bridge the gulf between ''digital haves'' and ''digital have nots'' and usher in digital inclusion based on technology which is developmental, inclusive and low cost. "That is the transformative nature of Digital India, Skill India, Startup India, Smart Cities. It is all technology-based programming designed to empower ordinary Indians to reform, perform and transform," Mr Prasad said.